Have you binge-watched Stranger Things on Netflix, yet? I literally can't get enough. That's saying a lot, because I don't watch a ton of TV. But I couldn't ask for a better way to wrap up the Fall season. And now it's time to start thinking about creative ideas for your holiday cards to send to all of your lovely friends and family. Yayy! 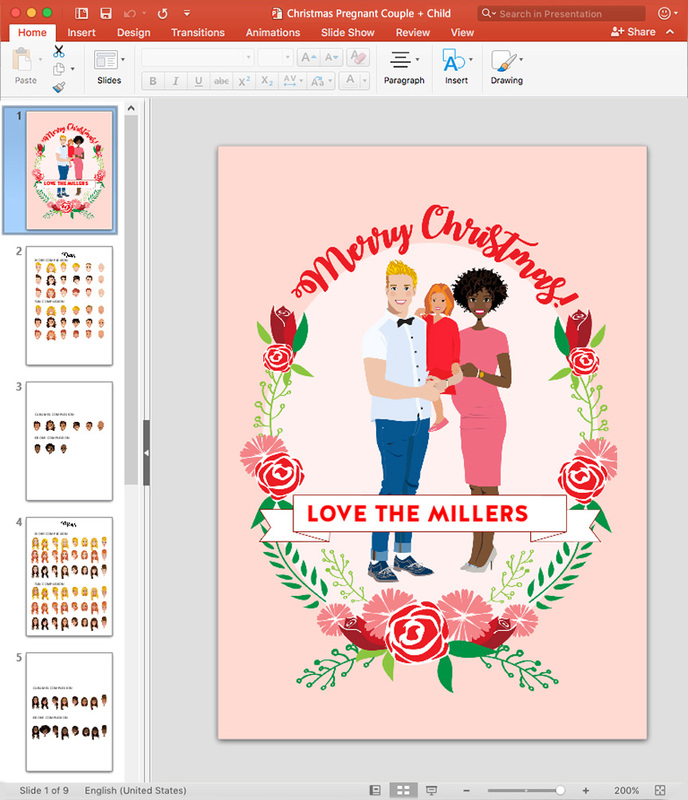 Below is a quick 'How To' guide showing you how easy it is to create DIY Holiday Cards using the tool I created in Powerpoint called the Christmas Card Portrait Builder. Download the file that best represents your family. Open the PPTX file and get started. Hint: If you don't have Powerpoint, no worries. Simply upload the file to Google Drive and you can edit it there. The first page is a pre-designed page. Simply delete the existing people to start with a clean slate. Hint: You may want to save as a copy so that you don't mess up the original file in any way. Scroll down to the page showing the different bodies and skin tones (Slide 6 or 7). Click on the body you want. Scroll up to the first page. Next, scroll down the page showing the different heads (Slides 2-4). Scroll down to Slide 9 to choose your greeting. Then delete the existing text, "Love the Millers" and write your own closing! Hint: Explore Creative Market to download really amazing fonts. Save Slide 1 as a jpeg. Now you have your Christmas Card ready to print! I usually like printing online with Overnight Prints because it's so easy, but UPS or FedEx are great local options. With each family template, there are over 75 different avatars so you are almost guaranteed to find matches for your family. There are also options with glasses, facial hair, etc. 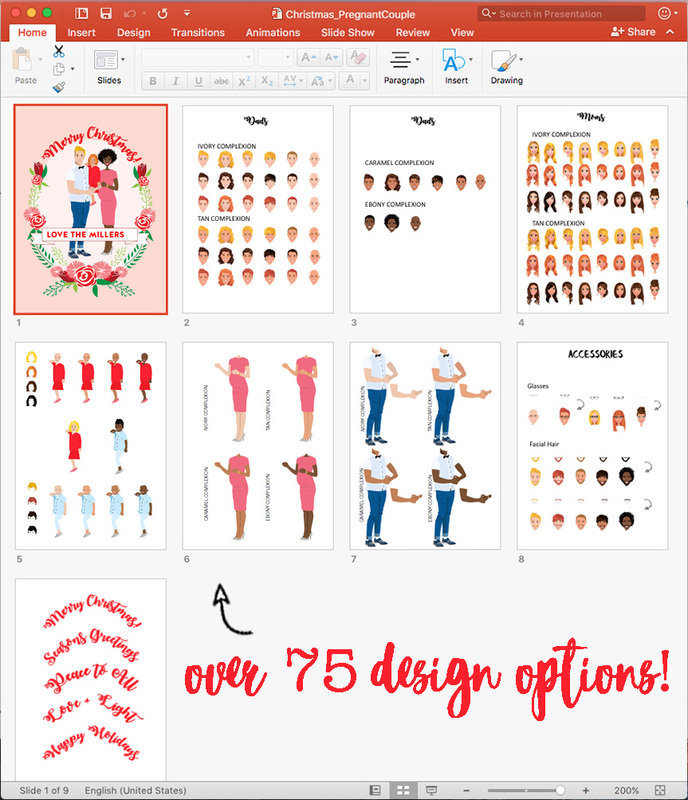 Additionally, you can delete the Christmas-y background and use it for family prints (or however you want)! Which, by the way, makes really special and inexpensive gifts. Just sayin'. :) Amazon has affordable white frames that look amazing. With this tool, you get to be the designer so your creativity is limitless. And if you don't see a good option for your family, but you are interested in buying this product, please email me at LaurenLesleyStudio@gmail.com. I also take custom orders and would love your feedback.